It was the musical goal of laughter that threw me. Typically the artistic goal is creativity itself, or if there is a stated outcome, it's about connection or inspiration. Laughter, on the other hand, is an outlier, one that belongs solely to Keller Williams. Williams is a veteran one-man band with 23 albums under his belt, the latest his first instrumental work entitled Sans. As Williams explains, laughter is a way of not only staying interested himself in what he is creating but in also providing a much-needed respite in the divisive times in which we live. On the eve of a release show at the Brooklyn Bowl for Sans, we caught up with Williams to hear more about the album's genesis and the importance of laughter and joy as a byproduct of art. Analogue: How have these days among tour dates been for you, creatively speaking? 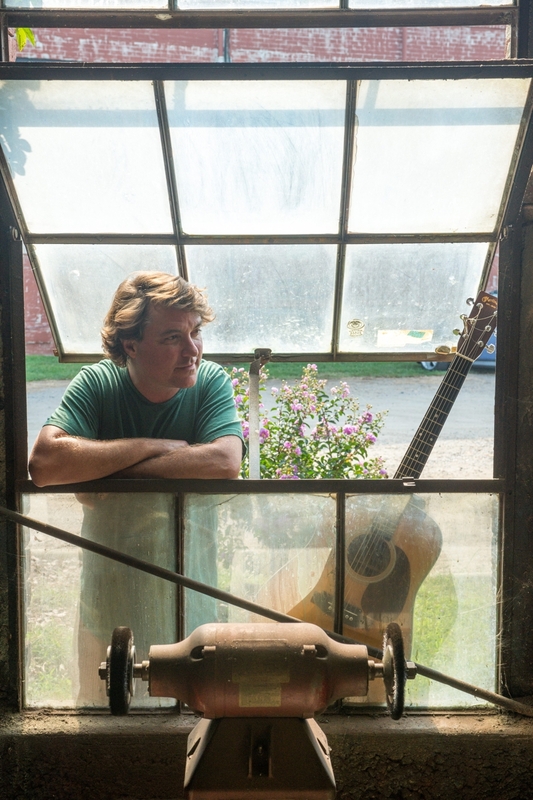 Keller Williams: I am dialing in songs. It's crazy. I've got all these ideas and tidbits of lyrics, so I'm trying to force myself to pull them all together. That doesn't happen often, but that's been happening the last couple days. That's exciting. Analogue: Is this a more prolific season than normal? Keller: My songwriting really comes and goes. I think the bulk of my songwriting came before I had kids, when I was touring a lot. I would be on for two or even three weeks and then I'd come home for the same. That first week was really about decompression, but the second week was when boredom would kick in. When that kicks in, there's an anxious road mind and that's when the creativity started to flow. Once I had kids, the boredom element went away. The songs just didn't come as much as they did before. So I blame the lack of songwriting on my children. It's their fault. [Laughs] But now they are 10 and 14 and I'm starting to get a little more time during the day while they are in school. Recently some of those things have started to come back. I've got four original songs that have taken a good year to come up with. I keep getting other album concepts to do while I'm waiting for this record of originals to appear. In today's world, I think I only need 42 minutes. If you're looking to do a record in a medium that's actually selling, you're looking at 22 minutes per side for vinyl. When I first started, we had 70 minutes for a CD so I'd write 13 or 14 songs to fill up as many minutes as I'm allowed on CD. Nowadays, CDs make really great scarecrows. You nail them to this cross and put a head on it. They also make really good drink coasters or baby mobiles. [Laughs] God knows I've got a lot of CDs in the basement. Analogue: After 22 albums, have you been around the block to know that there's always going to be something in the creative well? Keller: Yeah, these days I'm more into entertaining myself and making myself laugh when it comes to songwriting. I often try to put myself in the place of audience members. Growing up in the folk world and then the singer-songwriter world, if you put myself in those audiences, I'm usually bored. So I'm trying to find ways to make people laugh and that starts with making myself laugh. I think I still have a lot of laughter left in me to write more songs. So there's no back-up plan. The records will probably keep coming, too, whether they're my songs or not. I'm interested in documentation for something to listen to later. I want to make something really clean and cool. As far as songwriting goes, I definitely have songs left in me. Maybe what it is is that I'm getting older or more selective. The ones that remain are songs I can play over and over again and enjoy it. Then there are others that I think are good for a minute but then go away forever, never to return. I think there are so many forms of communication that focus on the anger and the division and what's happening all around today. All that's going to be there after my show is over. Analogue: Laugh is an interesting word choice there as a goal instead of more common sentiments like "cry" or "inspire." What made you choose that? Keller: Given what's happening today, I think there are so many forms of communication that focus on the anger and the division and what's happening all around today. All that's going to be there after my show is over. But during my show, I think it'd be great if everyone could forget it all for as long as I'm allowed to play, to be taken away from all of that. Analogue: The newest album is Sans, which is your first instrumental record. Has this idea been in the pipeline for a while? Keller: I've always had a love for instrumental music and even more for electronica. I never thought I'd had the chops to pull off an instrumental record. But then, I have all these instrumental songs I've been playing for years, some of which have been recorded and performed and others I've forgot. The longing here was to bring acoustic music to the dance floor in terms of acoustic instruments and guitar and upright bass but also use technology of the day like MIDI sampling and all these free grooves that are available in the studio, things you can dial up, and utilize that technology. That was the idea, to fuse the songs with the newer, electronic sounds. Analogue: Were you surprised by how some of the songs turned out? Keller: Yes, I was surprised in a very happy way, especially with the songs that had never seen a drum line or a bass part, you know? To hear it, it brings new life into it. It's not boring like the original. [Laughs] A solo acoustic guitar can only be so exciting. Andy Mckee, Kaki King, the late Michael Hedges—all these people are ones I could sit and watch for hours. But on a record, a solo acoustic guitar piece comes alive when you add technology and badass upright bass by Danton Boller.